The 7th of February was a very special day to go down and to be etched in the minds and hearts of all those who very warmly bonded together ath the Police Gymkhana. The function began by invoking God’s blessings on the ground, who were bubbling with affection and excitement. To add to their joy it happened to be Fr. Philip Terrasa’s 85th birthday. A few shared their school memories and achievements on their ladder of success. We were treated to a delicious dinner and the function wounded up with a very useful take away gifts. The gathering was well attended by the batch boys and staff of 1970. And the Principal Mrs. Jennifer Dias& Ms. Renee Carvalho. It is said “To meet and part is a way of life lent to part and meet again in the joy of living” and this was very true at the 50th Reunion of the Batch of ‘64 held on 18th December 2014. The reunion saw very prominent ex-students gather at their Alma Mater along with their spouses bringing back cherished memories and a tear to the eye. The day began with a photo session held in the school quadrangle with the old boys sportingly standing on the benches when they were young for the photographs, first with their class mates and next with their spouses. Present were the Manager of the school Dr. rev. Francis Swamy, The Principal Mrs. Jennifer Dias, Primary Head Teacher Mrs. Jennifer D’Souza and the alumni Co-ordinator. Next was a guided tour of the school and the projects completed. The Ex students visited their classes showing each other where they sat, clicking snaps, reminiscing good old memories, having a great time and voraciously enjoying themselves and being an inspiration to the present boys. They then proceeded to the C.C.I club for a sumptuous lunch at which a beautifully prepared PowerPoint presentation emoting sentiments of affection and gratitude was shown. The celebrations continued throughout and ended with a dinner at the Wellingdon Sports Club on the next day. In conclusion one could say that the reunion was very well attended and brought back cherished memories for the ex-students and a great sense of pride for the school as this batch saw achievers reach their heights in their respective professional fields. 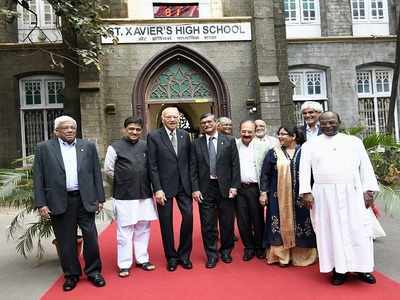 The students of the 1964 batch revisited their Alma Mater on the 18th of January, 2015. A few photomemories in the gallery below.